So you’ve decided to try meditation. Maybe you’ve always wondered about its much-talked-about advantages. Maybe you’ve checked out our primers and found a promising method for improving the quality of your sleep. Whatever your reasons, you’re keen for some peace of mind, as well as practical information on how to get started. There’s no shortage of resources on the web, but that can be a double-edged sword. With so many meditation techniques and traditions, and so many websites writing about them, the problem of finding reliable sources could easily be the newest entry on the list of things that keep you up at night. Here at Good Night’s Rest, we’re all about helping you sleep better, so we’ve selected eight of our favorite meditation blogs to give you a solid starting point. These sites cover a wide range of topics and methods, and approaches and scope vary from entry to entry on our list. What all of these sites share, though, is a dedication to providing valuable, comprehensive content in forms that are accessible to beginners. Pro tip: Subscribe to their newsletters to make sure you get their best and latest content as soon as it comes out. Check out our picks below! About Meditation is a fantastic first step for anyone looking to start meditation. The site’s blog features posts written by a diverse group of contributors, ranging from tech executives to yoga instructors to health psychologists and more. Their different backgrounds and experiences make for delightfully varied perspectives on meditation and how it can fit into your daily life. Aside from the blog, About Meditation is also brimming with content to supplement a regular meditation practice. There are mini courses and training programs to ease you into meditation, as well as a collection of resources from all over the web. The latter is divided into handy categories such as resources for beginners and for those who want to use meditation for sleep. 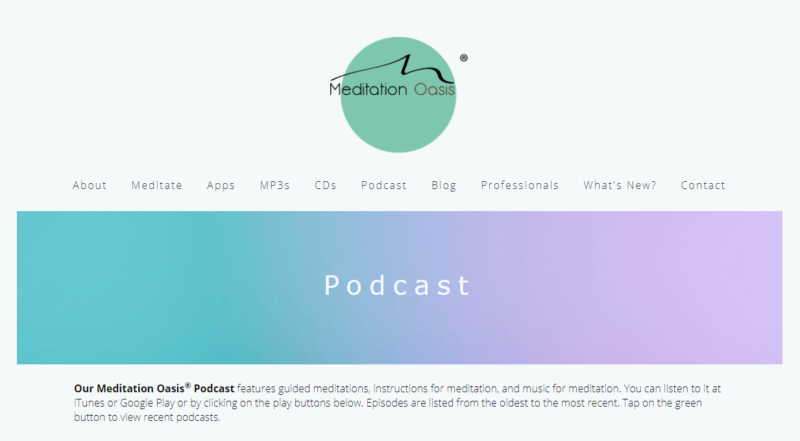 You’ll also find the OneMind podcast, where About Meditation’s co-creator Morgan Dix interviews meditation teachers, experienced practitioners, experts, and more. About Meditation also appears in our Top Mindfulness Meditation Blogs article. Most meditation methods draw from ages-long traditions, and Wildmind reminds you of how valuable that wealth of experience can be. Run by Bodhipaksa, a practicing Buddhist who’s taught meditation for over two decades now, Wildmind brims with definitive guides to the details that can make or break a practice. You’ll find a whole series of articles dedicated to meditation posture, for example, with checklists for different positions (sitting, kneeling, standing, etc.) and guidelines for your head, neck, shoulders, and so on. Similar guides exist for breathing, as well as for specific techniques like using a mantra while you meditate. If you’ve often wondered whether you’re “doing things right,” this is a great site to check out. Wildmind also appears in our Top Zen Buddhist Meditation Blogs article. Mindful’s best known for its bi-monthly flagship magazine of the same name, and you’ll find the same clean, thoughtful design and consistent focus on its website. Tons of well-presented and useful posts makes the Mindful site easy to browse and even easier to get lost in. What we love best about Mindful is its emphasis on the many ways mindfulness can improve life for you, your loved ones, and even your community. The overall approach here zeroes in on the little adjustments you can make and how they add up to create a more balanced life, sleep schedule included. Beginners who are wary of the time commitment needed to start and sustain a practice will enjoy Mindful’s simple, gentle approach. Mindful also appears in our Top Mindfulness Meditation Blogs article. There are different types of yoga and different ways to practice meditation, and Yoga Journal strives to be your trusty resource whichever ones you pick. Yoga Journal features regular contributions from an expansive community of practitioners, most of whom share illuminating personal experiences and insights about yoga and meditation. It’s the farthest thing from a hollow echo chamber, though: you’ll also find articles, videos, and guides from certified teachers and experts. There’s something here for you, whatever your chosen method, technique, or style, and you’ll always get the material in a sleek, user-friendly package to boot. Yoga Journal also appears in our Top Yoga Meditation Blogs article. Meditation Oasis is a fantastic resource for beginners and experienced meditation practitioners alike. We love the variety of material you can find here, from mobile apps to podcasts, downloadable music files, and more. It’s the kind of companion site that makes it easy for you to incorporate meditation into your daily routine, thanks to the flexibility that Meditation Oasis’ array of tools gives you. Though not dedicated to one specific method or tradition, Meditation Oasis does lean towards active techniques like walking and visualization meditations. If your overactive mind needs a routine that can keep up (and give you back the reins! ), this is a great resource to check out. Meditation Oasis also appears in our Top Visualization Meditation Blogs article. If you’re interested in transcendental meditation, the TMHome website should be your first stop. This site serves as online home for The Maharishi Foundation USA, one of the biggest organizations dedicated to transcendental meditation and the teachings of the Maharishi. Unlike other entries on this list, TMHome works more as a formal resource than a meditation-focused blog or magazine. You’ll find plenty of information to help you figure out if transcendental meditation is for you. There are links to research studies on its effects, introductory videos and articles that explain the method’s unique attributes, plus a handy guide for finding nearby teachers or centers. Our favorite part? 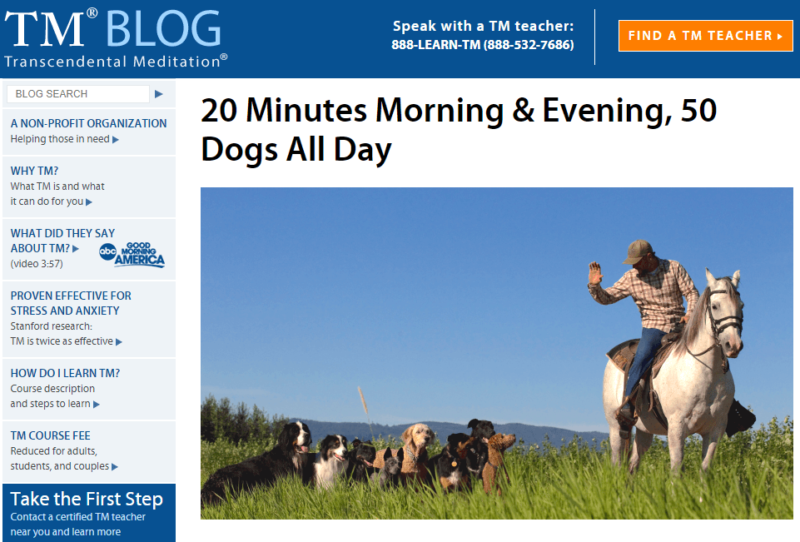 The blog, which regularly features stories from longtime practitioners about how they’re using transcendental meditation to address specific issues in their daily lives. The Maharishi Foundation USA also appears in our Top Transcendental Meditation Blogs article. Learning about ancient—and occasionally arcane—traditions is best done under the guidance of an expert, and when it comes to qigong, Chinese healing and martial arts, Dr. Yang Jwing-Ming is one of the most widely respected today. YMAA proves that he’s also one of the most accessible. This site is home to Yang’s Martial Arts Association, Dr. Yang’s Boston-based organization dedicated to teaching Qigong and Chinese kung fu traditions. The well-organized blog gives you a direct line to Dr. Yang’s well of expertise, with deeply researched articles on various aspects of qigong. Even better, the YMAA blog also plays host to various expert contributors from fields like medicine, traditional Chinese healing, and Chinese martial arts. YMAA also appears in our Top Qigong Meditation Blogs article. Heart rhythm meditation was developed by the couple Susanna and Puran Bair, and for the most comprehensive information on the method, it’s best to go straight to the source. 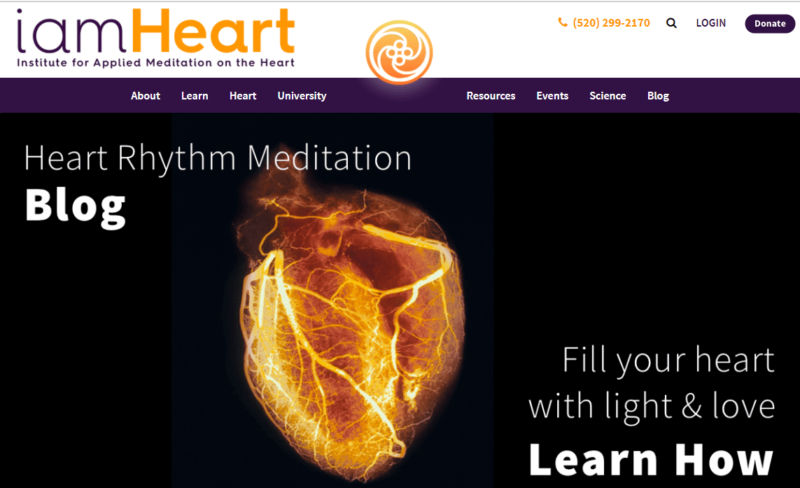 The nonprofit Institute for Applied Meditation on the Heart is headed by the Bairs, and it serves as the main online hub for all things heart rhythm meditation. You’ll find free resources ranging from guided audio meditations to a podcast that discusses heart rhythm meditation’s applications to various personal issues to a blog with prompts for reflection and helpful explanations of concepts like “archetypes” that can enhance your meditation practice.